You can modify each registered time trace in the "Time trace" window. The trace has three basic properties: the start date/time, the end date/time, and the activity it is registered on. Each of these can be modified. If the time trace is still open (if this time trace is the trace for the current time registration), you can press the "Stop working" button to end the time registration. After you press "Stop working", the end date and time can be altered for this trace (if needed). If you have just created a new time trace, its start- and end date/time will be pre-set to the standard working hours on the current day. These standard working hours can be changed in the "Settings window". 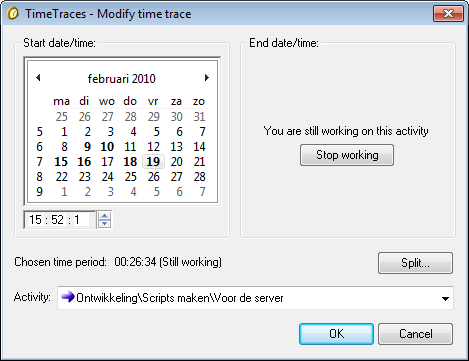 To remove a time trace, you have to use the "Remove" button from the "Manage time traces" window. The "Time trace" window will be shown when you add a new time trace from the main window (via the "Time \ New time trace..." menu item or button). 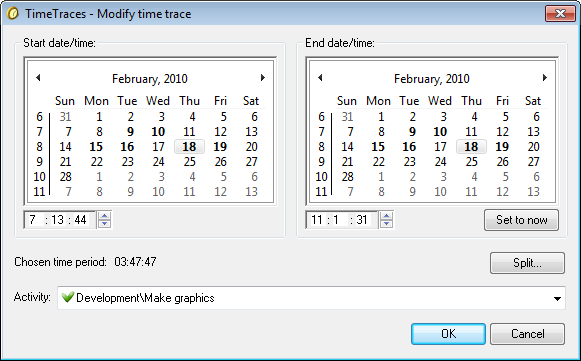 It will also be shown from the "Manage time traces" window when adding a new time trace ("New..." button) or modifying an existing time trace ("Modify..." button). The start date/time of the trace. You can access this section with the key combination "Alt + S"
The start date of the trace. The calendar shows days that are worked on in bold. The start time of the trace. The up-down buttons next to the time fields allow you to increase and decrease the value in the selected time field. Valid input for the time fields is 0 to 23 for the hour field, and 0 to 59 for the minute and second fields. The end date/time of the trace. Its usage is similar to the start date/time section. You can access this section using the key combination "Alt + E"
Sets the end date and time to the current date and time. Only available when the trace is not being worked on. Stop time registration in this trace. Only available when the trace is still being worked on. When you press this button, the current date/time will be used as the end date/time. Shows the size of the time period as chosen in the start- and end date calendar and time fields. When the trace is still being worked on, this will be reported instead ("Still working"). The activity for the trace. You can choose another activity for the trace. Note that only activities that are marked as enabled (a green checkmark) can be used to book time on. Split the time trace. This will open the "Split time trace" window. After splitting the time trace, the second time trace will be displayed. Exit the window and update the time trace with any changes. Show the "Time trace" window help page.